I think I actually got everything crossed off my list this weekend. Yesterday I took my parents to the used furniture store and my mom bought 2 chairs. Then we checked out our favorite stores in the town that they are moving too which are Ross and Big Lots. I bought a few things, they bought a few things. I don't know what to get people for Christmas but I like to buy things online unless they live with me. I don't want to have to ship things plus the lines in the stores were really long. Today I went back to my friend's estate sale and spent another $15. I found 3 small gifts. Next I stopped at the grocery store and went a little crazy. Then the ATM and the library to pay my nephew's tutor. I haven't decided if the tutor is really helping him or not. It sure is easier for me to have someone else help him with his homework though. Laundry was next and then I finally had time to break out the Christmas decorations. 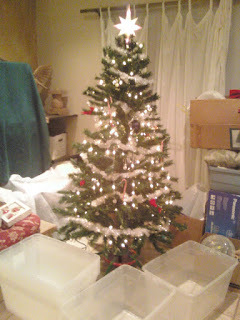 I put up my tree with the lights and garland but we haven't put all of the ornaments on yet. 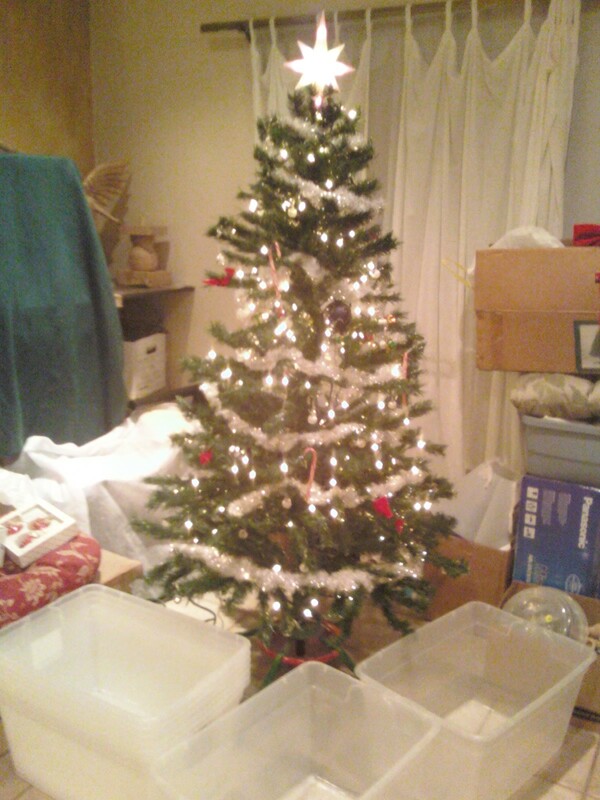 I put the storage bins around the bottom so that the dogs won't mistake it for a real tree. The living room, where the tree is, is a mess because my parents are moving but we will just make this the Christmas corner and try to keep a space clear for presents. I even put a string of icicle lights outside. The carport already had hooks so it was easy. This is the first time I have ever put lights outside. Some of my neighbors have gone really crazy with the decorating. Maybe I'll find some good deals on outside decor at the after Christmas sales so that next year I can join this unofficial house decorating club. Nothing too fancy. I just want some giant candy canes and oversized ornaments and lights on all the cactus and....I'd better stop now. Pretty star on top of the tree! Sounds like it is all going well. I dont put outside lights but I do put the inside ones around the window so you can see them in the street. Its enough! Thanks, Lee. The star looks better in the picture than in real life actually. That's right, flower girl. I have one by my house and I have to stay away or else I will buy all the dog beds, leashes, and collars and I don't have that many dogs. Lizzie, that's what I did at my rental house. It had a nice bay window for the tree and lights. This house doesn't have a nice front window like that. I suppose I could put some around the door.